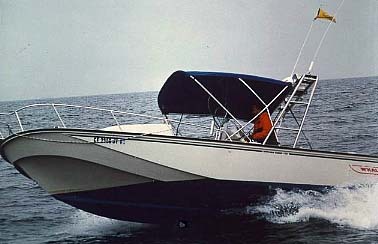 Following on the acceptance of the Revenge (see Cetacea Page 46) as a model with sleeping accommodations in a bow cabin, Whaler created a a second adaptation of the 22-foot Outrage hull, the OUTRAGE CUDDY, which preserved the center console nature of the boat but added a small foredeck and cuddy shelter in the bow. The Outrage Cuddy has a lower profile and the cabin has less headroom than the Revenge. The layout appeals more to folks who want an open boat but would like a lockable cuddy cabin that can be used for both storage and some overnighting. "The console is the smaller model, due to the limited cockpit area afforded by the cuddy cabin configuration. With the addition of the forward IGLOO seat and the stern seat, there is plenty of seating area for cruising, however, at times this setup does make for cramp quarters. I had a teak shelf made to accommodate the three electronic units and still keep the compass location intact. I also installed a larger speaker in the blank instrument panel left of the helm. I could not hear the VHF radio factory speaker while underway. Another very helpful modification was increasing the size of the anchor chain hawsepipe to the below deck locker; the OEM pipe was too small to accommodate the rode and chain that I was using for my anchor. 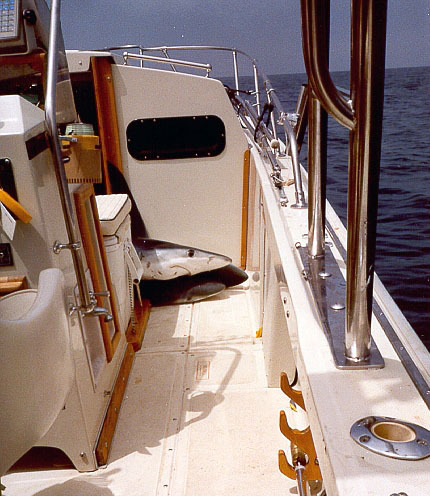 "The most significant modification on my boat is the stainless steel radar arch. The arch allowed me to mount the radar dome, LORAN whip and VHF antenna. Also mounted on the arch is the masthead light, two 3"x 6" deck lights (forward and aft), electric horn and rocket-launcher rod holders. Lastly, I do have an interesting story about why I named my boat VICTORIA. "Victoria" is a common boat name. However, to me it has special meaning. Everyone who is an ocean boater knows, or should know, the story of Magellan. Yes, he was the first sailor acknowledged for sailing around the world. However, Magellan actually did not survive the entire trip. He was killed in the Philippines when he got a little greedy and was attempting to conquer the locals. Anyway, Magellan's expedition started with 5 ships. One turned back early on and three others were lost at sea. Only one ship made it back to Europe. The name of that ship was VICTORIA, and her captain was Juan Sebastian DeCano. 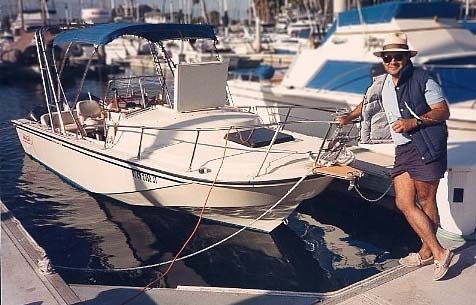 My Whaler was my first boat, and when I'm out to sea, I always want to come back. 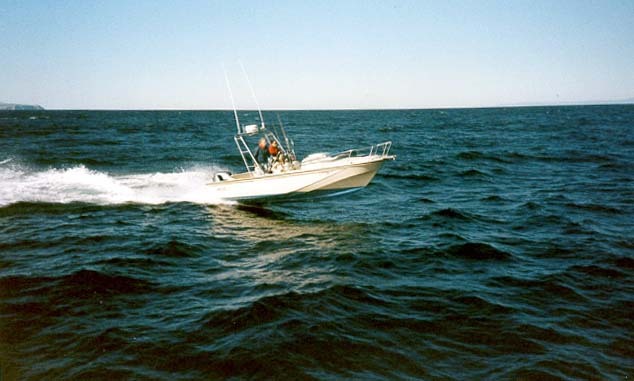 The best way for me to ensure that was to buy a Boston Whaler, and name it VICTORIA". Oh yes, and it doesn't hurt to have the last name of Cano! I really don't know if Juan and I are related. However, I would like to think so! Mario Cano's fine 22-Outrage Cuddy VICTORIA enjoys year round berthing at Channel Islands Harbor, Oxnard, California. 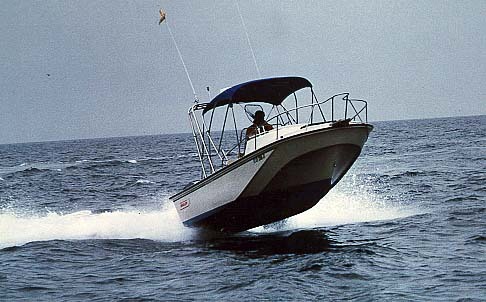 The familiar lines of the 22-foot hull are seen here cruising at speed on the Pacific. Some air under the hull. 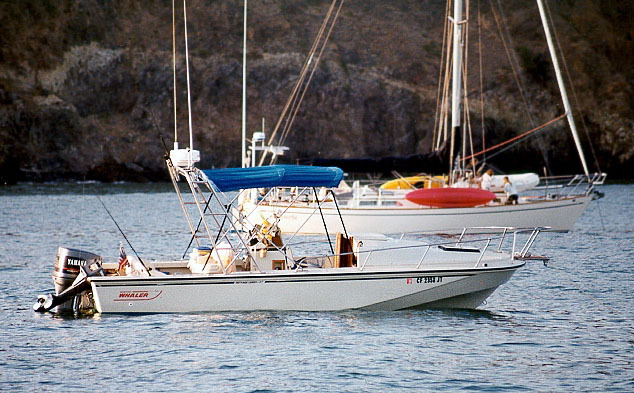 Smuggler's Cove in the Santa Cruz Islands provides this nice backdrop for the classic lines of the Outrage Cuddy. VICTORIA's helm console is the smaller console option. The Mills Bimini provides plenty of shade. (Note silk label top center.) Raytheon instruments fill the console, including Radar. 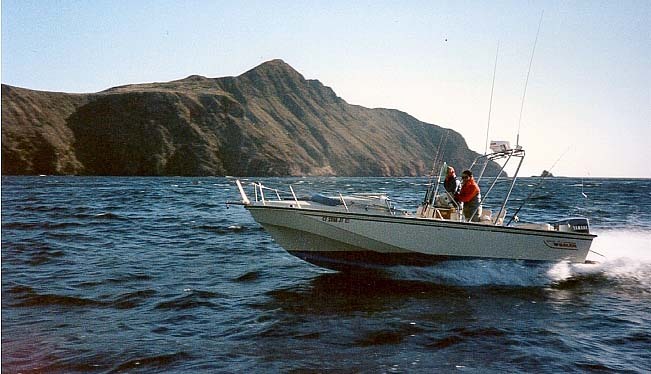 With the Bimini top down, the 22-Outrage Cuddy cruises past Anacapa Island and through the Pacific chop. That's a lot of ocean out there! You probably don't see too many other 22-foot outboards in these waters. 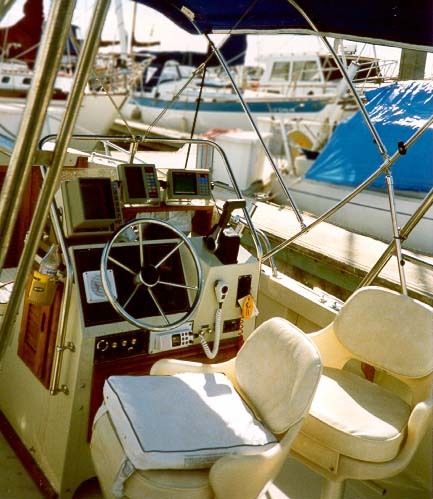 The many teak and mahogany wood trim elements of the Whaler cockpit can be seen in this view. Four 6-ft Blues hitch a ride after a Shark Tournament. "Nobody wanted to sit on the IGLOO cooler seat on the way home," says Mario. The page has been accessed 43533 times. Copyright © 2001 by James W. Hebert. Unauthorized reproduction prohibited! This article first appeared December 31, 2001.